Dr. Joshi was born in New Delhi, India, many (or not so many, depending on your POV) moons ago. Assorted geeeky acts like memorising the schedule for Indian Railways (North Zone) at an early age showed to all and sundry that he was destined to be a Professor. He set out to fulfil this prediction with gusto, in the process asking long, complicated and troublesome questions of his teachers at Modern School and IIT Delhi. While in his senior years in high school, and through his undergraduate education, he continued his interest in asking (and answering) questions by representing his institutions in debating and quizzing at an intercollegiate level. He also got involved in research activities, which lead him to Purdue University in 1989, from where he obtained his Ph.D degree in 1993. 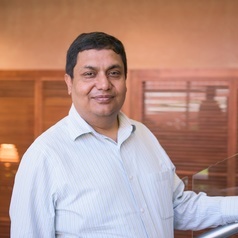 After a stint at Purdue as a research faculty, he headed off to the University of Missouri in 1996, and spent two wonderful years there as Assistant Professor of Computer Engineering and Computer Science. In Fall of 1998, he exchanged life in small town midwest surrounded by fields of corn for life in suburban big town east cost. Currently, he is found roaming the campus of the University of Maryland, Baltimore County, where he is now free to profess, after several years of first assisting and then associating with other professors. He continues to ask many questions as a part of the UMBC Ebiquity Research Group, though he concentrates on answering only some of them.